Discount cards are an excellent and easiest way to reach your target customers. Discounts are offered as per the discount card terms and conditions. They are an excellent way to attract new customers. Itspossible Marketing Limited is engaged in manufacturing, exporting and trading of wide range of Discount cards, Dining Cards, Loyalty cards and Restaurant Membership Cards. 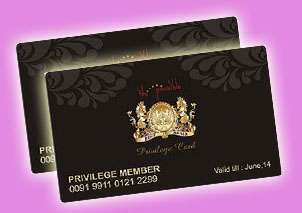 We provide a comprehensive range of high quality Discount Card to our esteemed clients. We use high quality quality material to create these cards. Our valued customers can get the discount cards at industry leading rates.